As I often do, I began looking for the story behind the story. 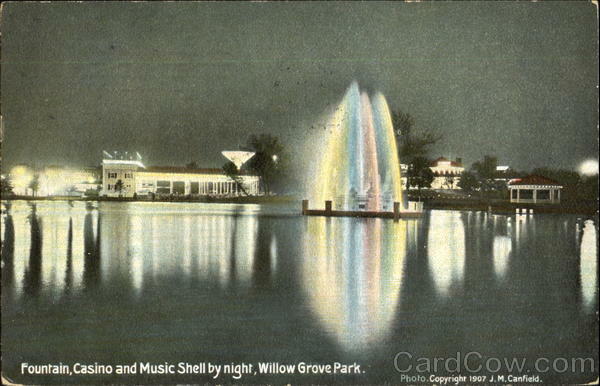 One of the most exciting things I've learned is that Willow Grove (in Chapter 15) was a real park! Grace Livingston Hill lived in Swarthmore, Pennsylvania, which is not far from Philadelphia. In this and many of her other books, she uses her home surroundings as a background for the story. 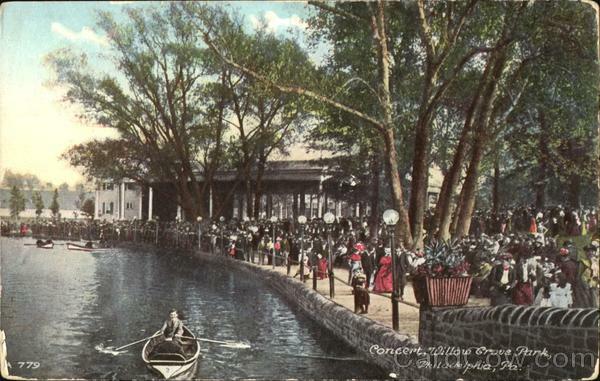 Willow Grove Park was a "trolley park". There were many of these in Grace's era and they were built to encourage trolley ridership outside of the regular "business commute" through the week. They featured many kinds of entertainment, including amusement park rides, music, and much more. Willow Grove Park in "The Girl from Montana"
When The Bradys take Elizabeth to the Sunday School picnic, Grace is describing things that really existed at the park. Let's set the scene. "It was a long day and a pleasant one even to Elizabeth. She had never been to Willow Grove before, and the strange blending of sweet nature and Vanity Fair charmed her..."
"They mounted the horses in the merry-go-rounds, and tried each one several times...They went into the Old Mill and down into the Mimic Mine, and sailed through the painted Venice... The Venice attraction must have been a sight to see. It's said that the builders of the attraction actually went to Venice for inspiration! They stood the first half of the concert well, but at the intermission they wandered out to view the electric fountain with its many-colored fluctuations, and to take a row on the tiny sheet of water." 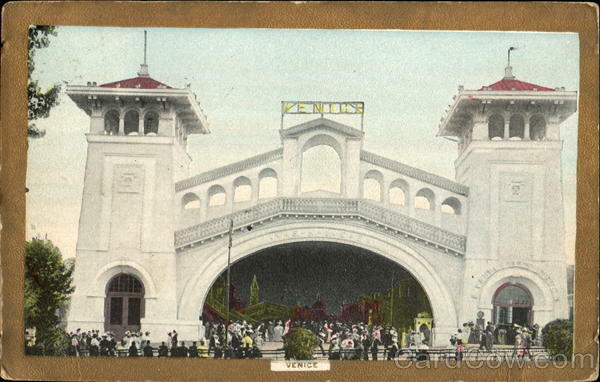 You can read all about the park and its history and see vintage postcards of many of these rides at the Willow Grove Park website, which mentions the Venice ride and others. This site contains a wealth of information about the park and includes "A Walk Through the Grove" and "A Performance" using postcards. Just look for the "next" link below the images to page through the postcards and descriptions. Walter Damrosch conducted the New York Symphony Orchestra and was a regular at the park beginning in 1897 and continuing through several seasons. Along with Damrosch, many other famous conductors appeared over the years. John Philip Sousa is one among many that you might recognize. You can read much more about Damrosch and the other bands at the Willow Grove Park website. "It was just at the close of this wonderful music, which the programme said was Mendelssohn's "Spring Song," when Elizabeth looked up to meet the eyes of some one who stood near in the aisle watching her, and there beside her stood the man of the wilderness!" If you've never heard "Spring Song before, you can now. Just click play. I was surprised that this is a very familiar tune, although Grace might consider my familiarity with it a bit low-brow. This tune is a common one in vintage cartoons, including Popeye's "Ballad de Spinich" from 1960. "O Bess! Bess! B-es-see! I say, Bessie! Ma says we'll have to go over by the cars now if we want to get a seat. The concert's most out, and there'll be a fierce rush. Come on!" She wasn't kidding...according to the Willow Park Grove website, "Printed reports indicated that audiences of 40,000 people were common for concerts at the park." It's said that the trolley station could handle 100 cars, but still the wait for a seat would have been a long one. It's a good thing that George brought his automobile! Sadly, Willow Grove closed in 1975, but there are a few other vintage trolley parks still standing if you'd like to visit one yourself. Today, the Willow Grove Park Mall stands where the trolley park once stood. It's doubtful that many of its patrons understand the origin of the name.